The party and political work forms the backbone of the Army. The proper implementation of the party and political work in all missions contributes to promoting the Party’s absolute and direct leadership over the Army and building a politically strong Army as the basis for fostering the overall quality and combativeness and accomplishing all the set tasks. Therefore, enhancing the effectiveness of the party and political work is a matter of great significance in the current period. Over the course of the Army’s building, fighting and maturing, deep-rooted in every organization, force, unit and mission, the party and political work has always been considered a crucial component in the Party’s leadership over the Army. It is fair to say that party and political work is ubiquitous in every military unit which firmly orients soldiers politically and ideologically in any circumstances. The enhancement of the party and political work acts as a determinant to the Army’s combativeness, ensuring the Army a loyal and reliable fighting force of the Party, the State and people. Fully aware of those missions, over the past years, army-wide offices and units have thoroughly grasped the Party’s military-defence guidelines and viewpoints, resolutions and directives by the Central Military Commission and the General Department of Politics on military-defence missions and the building of the politically strong Army, satisfying the requirements for Homeland protection in the new situation whilst concentrating their leadership and directions on promoting a sense of responsibility amongst organizations and forces, especially the role of party committees, commissars, commandants, and political offices at all levels; on reforming content and forms and efficiency of the party and political work in all missions, particularly training and combat readiness missions, discipline maintenance, search and rescue and natural disaster relief operations, etc., thereby contributing to cultivating revolutionary soldiers’ political willpower and virtues and dignity; raising soldiers’ awareness of their missions and blood relationship with the people; pinpointing objects of struggle and partners of cooperation, artifices and stratagems by hostile forces as well as particularities of current Homeland defence; firmly comprehending and creatively applying training principles and mottos; and closely combining training missions with political education, and ideological management with discipline maintenance. The operation of the party and political work has made active contributions towards strengthening the quality of defence-security education for all objects; upholding the role of local military establishments in giving sound advice to local party committees and governments on leading and directing military-defence tasks and socioeconomic development in tandem with defence-security consolidation and the building of stronger local defensive areas; improving the overall quality and combat readiness capabilities of local armed forces; well executing the building of reserve, militia and self-defence forces and call-up planning. Simultaneously, it has contributing to educating soldiers about the spirit of risking their life and limb to save people in dire need; to tightly cooperating with relevant forces in effectively forecasting and coping with natural catastrophe, etc., thereby restoring people’s confidence and brightening up “Uncle Ho’s soldier” image in the new period. Yet, in addition to recorded accomplishments, the operation of the party and political work still exposes some limitations. Some of offices and units have yet to creatively innovate operational content and forms of the party and political work as evidenced by insufficient breakthrough solutions to the increased quality and effectiveness of the party and political work in all missions. Some cadres’ capability to carry out the party and political work at grassroots levels still has yet to meet mission requirements, etc. Over the time to come, military-defence missions, military building and Homeland protection will be increasingly demanding, necessitating the Army not only ceaselessly boosting political quality and combat readiness capabilities; proactively grasping all situations and handling contingencies in actuality; participating in dealing opportunely and effectively with natural catastrophes, epidemics, environmental disasters and ensuring political security and local social order and safety, but actively and proactively foiling false viewpoints and ideology, stratagems of “peaceful evolution”; “self-evolution” and “self-transformation” and military “depoliticalization”; firmly gripping the Party’s ideological foundation; building the politically strong Army, accomplishing all the set tasks, and contributing to maintaining a peaceful and stable climate for national construction and development. To this end, chief amongst key elements is to reform the content and solutions to enhancing the quality and efficiency of the party and political work in all missions. First, upholding the leadership and directive role of party committees and organizations; fostering a sense of responsibility towards the party and political work amongst cadres and party members, particularly key cadres at all levels. The party and political work is amongst fundamental duties and responsibilities falling to party committees, commissars, and commandants; the execution of the party and political work rests with every organization, force, cadre and party member in which party organizations and a contingent of political cadres at all levels have the key role to play. The realities have shown that the more the leadership and directive role of party committees and organizations, commissars, and commandants gets promoted, the more effective the party and political work will be. To this end, it is essential to make party committees and organizations strong politically, ideologically, organizationally, and morally in accord with Resolutions of the 12th National Party Congress and the 10th Military Party Congress; to ceaselessly accelerate leadership competency and combativeness and creativity through their role as the units’ political leadership nucleus; to combine the building of strong and pure party organizations with that of comprehensively strong offices and units whilst it is crucial to thoroughly grasp and effectively implement Resolution of the 4th Plenum of the Party Central Committee (12th tenure) on Party building and rectification in alignment with Directive 05-CT/TW by the Politburo on “accelerating the study and following of Uncle Ho’s thought, morality and lifestyle”; precluding the manifestations of political, ideological moral and lifestyle degradation and “self-evolution” and “self-transformation” from within. Great weight has been attached to innovating, cultivating, and enhancing leadership and directive capabilities; to briefing all-level party committee members, particularly heads of party committees and commandants on resolutions and directions pertaining to the party and political work; to regarding the enhancement of efficiency of the party and political work in all missions as every party committee and organization’s routine activity. The leadership content of the party and political work should be comprehensive and focalized around fundamental and key missions. The leadership effectiveness of party committees and organizations must be manifested in perception and execution of higher echelons’ instructions, resolutions, and directions on training, combat readiness missions, discipline maintenance, organizational reshuffle, administrative reform; military-run enterprise restructure and streamlining; local military-defence work; natural disaster relief, etc. Simultaneously, it is important to improve capability and method of carrying out the party and political work; to cultivate moral virtues and lifestyle as well as “words match actions” working style amongst a contingent of cadres and party members, especially key cadres; to properly handle relationship between leaders and commandants; to combine the responsibility of key cadres with the performance of offices and units’ missions. Second, promoting the work of political education and ideological management; raising soldiers’ awareness of their missions and firmly preserving the Party’s ideological foundation in the Army. Chief amongst the fundamental issues of the party and political work is to ceaselessly foster the Party leadership and the nature of working class in the Army; to render cadres soldiers absolutely loyal to Marxism-Leninism, and Ho Chi Minh thoughts and steadfast in the goal of national independence and socialism; to successfully execute the Party guidelines, the State policies and laws, and the Army’s missions. To this end, the whole Army needs to continuously reform content, forms and methods and effectiveness of the work of political education and ideological orientation, meeting mission requirements in the current situation. Its content must be comprehensive but focalized with great emphasis devoted to disseminating Marxism-Leninism, Ho Chi Minh thoughts, the Party’s political and military guidelines, revolutionary and moral dignity and great nature and tradition of “Uncle Ho’s soldiers” and tasks of defence and security reinforcement, military build-up and Homeland protection. Great value has been attached to propagating and educating units’ missions, soldiers’ rights, duties and responsibilities, thereby laying out appropriate targets, motivation, determination to surpass all the hardships, willingly undertake and accomplish assigned missions. In the immediate term, it is essential to concentrate on renovating forms and methods of political education in military units and of scientific sociological and humane education under the motto “practical, efficient, and grassroots-oriented” while it is vital to maintain revolutionary vigilance; proactively and resolutely combat misleading viewpoints, artifices and stratagems of “peaceful evolution”, military “depoliticalization” by hostile forces as well as manifestations of political, ideological, moral and lifestyle degeneracy and “self-evolution” and “self-transformation” from within, thereby creating higher unity in the entire Army. Third, continuously renewing content and diversifying forms and methods of carrying out the party and political work, satisfying the requirements for military build-up in the current period. Those enable the party and political work to become the “backbone” of the Army. The innovation of content, forms and methods of implementing the party and political work must be in compliance with unified instructions by the General Department of Politics, competent agencies and grassroots units and every office and unit’s particularities, thereby promoting a greater sense of responsibility, creativity and proactiveness amongst party committees, commandants, and political agencies at all levels. Grounded in the requirements for military building in the current situation and beyond, the innovation of content, forms, and methods of conducting the party and political work need to be fundamental, systematic, updated and comprehensive, thereby directly contributing to building revolutionary soldiers’ nature and dignity and the “revolutionary, regular, elite, and gradually modern Army”. During the implementation process, it is necessary to research and apply precious lessons and experience drawn from the course of over 70 years of the Army’s building, fighting and maturity; to take an innovative and appropriate approach to soldiers’ cognitive ability and mission requirements. Fourth, building a stronger contingent of commissars and political agencies at all levels, matching higher quality and effectiveness of the party and political work in all missions. In their capacity as a key force, the contingent of commissars, political cadres and agencies acts as a determinant to the quality and effectiveness of executing the party and political work. Accordingly, it is essential to continue to seriously carry out Resolution No. 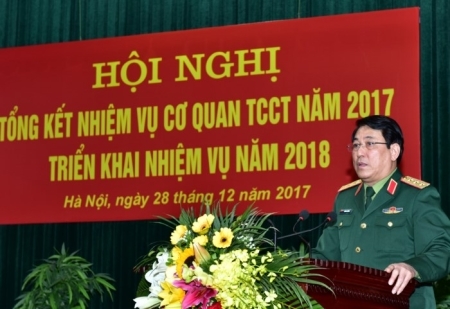 51/NQ-TW, dated 20/7/2005 by the Politburo on “Continuously perfecting the Party’s leadership mechanism, implementing the commander – commissar regime in the Vietnam People’s Army”. In the immediate term, it is crucial to review the quality and quantity of contingent of army-wide political cadres for personnel planning in border, island and newly established units; to improve the quality of political cadre training in military schools; combine in-site training with refresher courses pertaining to the work of party and political work. Due attention has been paid to building strong all-level political agencies which actively give sound advice to party committees, commissars and commandants on executing the party and political work in a regular and effective fashion. Fifth, accelerating the aggregate strength to step up the efficiency of the party and political work in all missions. The party and political work involves a vast variety of activities, organizations, and forces with their distinctive function, tasks, and operations. Therefore, on the one hand, there should be close coordination amongst those forces and organizations in an effort to generate the aggregate strength for higher effectiveness of the party and political work in all missions; on the other hand, it is necessary to guarantee logistical, technical and financial resources as well as necessary equipment and facilities for the party and political work; to reform and intensify the quality of cultural institutions at grassroots level. In addition, it is essential to perfect and effectively regulate cooperative mechanism between the Army and central departments, ministries, sectors, and mass organizations. Great importance has been attached to the work of preliminary and overall assessment for every mission and stage for the purpose of improving the efficiency of the party and political work in the new situation. Improving the effectiveness of the party and political work in all missions is a fundamental matter of promoting the Party’s leadership over the Army, building the politically strong Army with absolute loyalty to the Party, the Homeland, and people, successfully fulfilling all the tasks in the cause of current defence consolidation and Homeland protection.